The increasing popularity and availability of multicore processors is creating a whole new set of challenges–although you can enjoy true concurrency, you’re now faced with higher contention and synchronization issues. Deploying an existing application on a multicore processor may bring out previously hidden concurrency issues. Java’s multi-threading facility by itself isn’t enough—it’s a very low level abstraction. Instead, you need a paradigm that provides a higher level of abstraction to deal with concurrency. It’s time to embrace Functional Programming. Scala is a hybrid Object-Oriented/Functional Programming language on the JVM. Using Scala, you can create traditional imperative programs, intermix them with Java code, and at the same time take advantage of higher levels of abstraction. You can use features that lead to concise, highly expressive code that remove the pain of dealing with concurrency. Programming Scala will show you the fundamentals of functional programming using Scala. Very quickly, you’ll learn how this statically typed language can give you dynamic capabilities to create concise, scalable, highly capable concurrent code. Pragmatic programmers always use the right tool for the job. 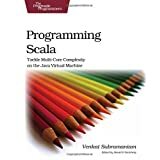 For concurrent programming on the Java VM, Scala is the tool, and Programming Scala by award-winning author Venkat Subramaniam is your guide.